GEFFS Manufacturing is proud to be a trusted western distributor for high quality Laymor Sweepers & Construction Brooms. 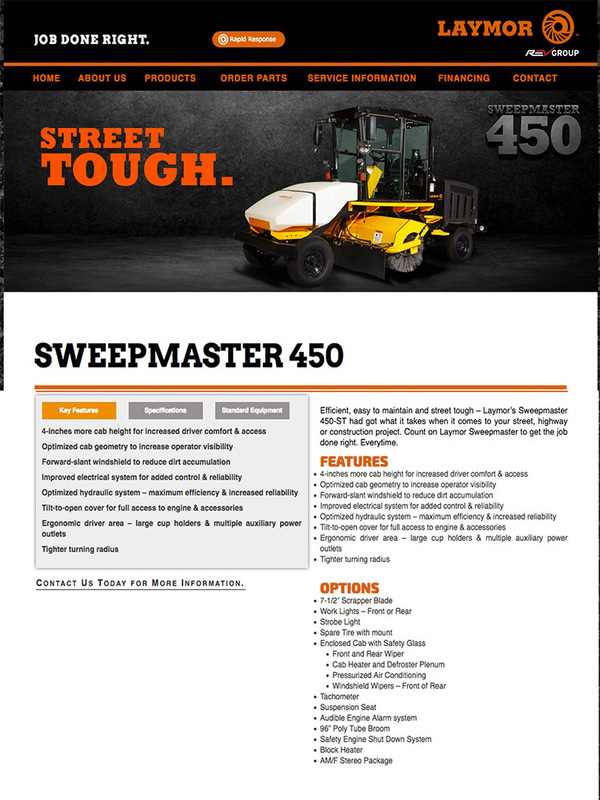 Ask us about the new, updated flagship Sweepmaster 450-ST. Call Dave at GEFFS Manufacturing 208-232-1100 for all your new sweeper needs. LayMor sets the standard for high performance, long lasting Street and Construction Sweeper Brooms. Now your choices are even better. Introducing all new and upgraded Sweepmaster 450 ST. Larger and more comfortable driver's station, easier engine access and a tighter turn radius are just some of the new improvements. Check out the new specs right here. Below you can learn more about the 450-ST's predecessor, LayMor's original Sweepmaster 450. Call Dave at GEFFS Manufacturing for more information and to get any questions answered. "Our sweepers are manufactured in an ISO:9001 facility in Longview, Texas. Laymor offers a wide variety of sweepers for the rental and paving industries, including the Sweepmaster 300, and Sweepmaster 450. Our Mission is to provide our customers with high-quality sweeping products, along with great customer service, at a reasonable price. The SweepMaster 450 offers fast, efficient performance with work speeds up to 12 mph and travel speeds up to 25 mph. 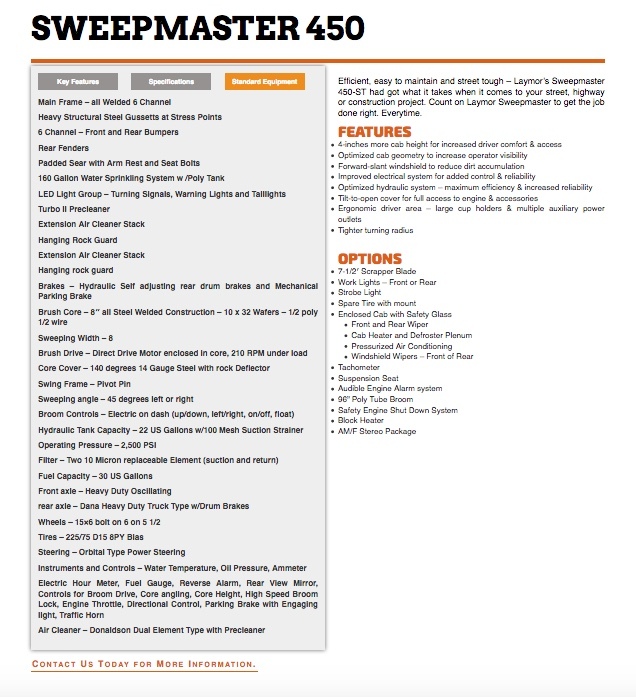 The SweepMaster 450 has an all new look with a variety of updates and improvements." Laymor proudly manufactures a variety of sweepers and sweeping products for the pavement industry and more. These sweepers are easy to transport, use and maintain, making them the industry’s sweepers of choice. 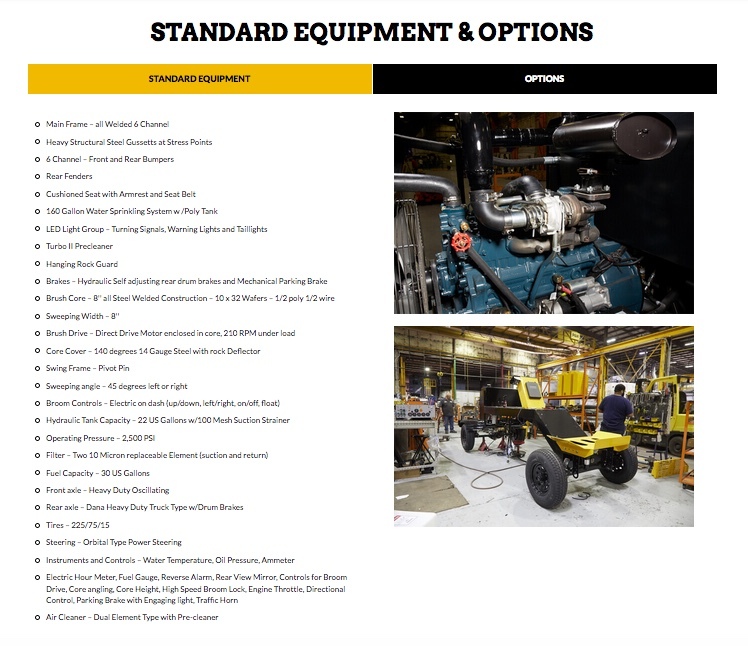 What’s more, Laymor equipment is designed with operator comfort and safety in mind. Starting in 1977, Laymor has manufactured sweepers for the rental and paving industries for almost 40 years. Laymor sets the standard for quality with products prized for their reliability and effectiveness. Their mission is to provide customers with high-quality sweeping products, along with great customer service, at a reasonable price. GEFFS Manufacturing carries Laymor Sweepers for sale or rent. A Laymor sweeper is towable without jacking. Laymor Sweepers are easy to operate, highly maneuverable, and low maintenance. GEFFS Manufacturing is proud to be a Western Distributor for Laymor Sweepers. We can meet all your Laymor needs. Call Dave at 208 232 -1100.